Ahhh, 2016—feels like yesterday. Reflecting back to the good old days, one strong current that kept me off the beach was the Buddha Bowl trend. I’ve been composing bowls and plates filled with an assortment of nutritional goodness (usually a compilation of leftovers) well before the name was penned. But I was loathe to be trapped in the Buddha Bowl wave, revisiting old recipes of healthy goodness and rewriting their names so that they could find their way to a Pinterest board. It’s the name. Buddha Bowl. 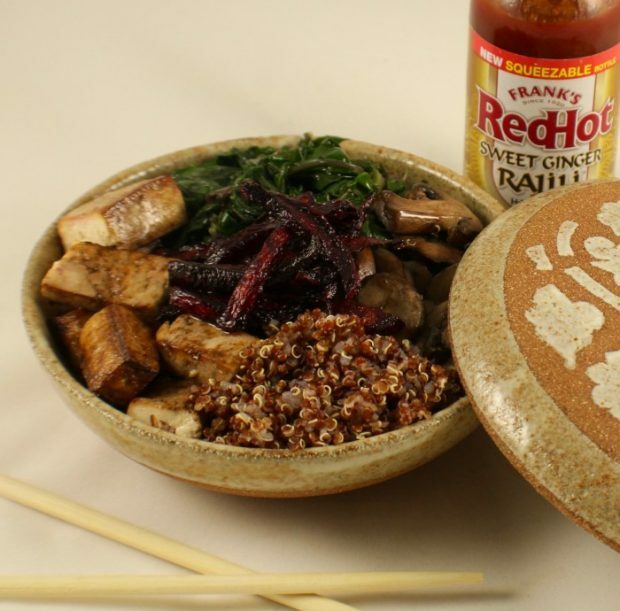 Did Siddhartha feast with a Buddha Bowl to celebrate his enlightenment? The concept brings to mind the granola and nutrition bar aisles in supermarkets. Such excessive branding as they fight to capture the latest food fad flag, yet most are loaded with fat and sugar. And yet. Buddha Bowl. It caught the wave. Great alliteration. I was delighted to find a lonely beet hidden beneath some potatoes to julienne, stir-fry and add to my Buddha Bowl. A quick Google of Buddah Bowls yields recipes with a common theme: a layer of grains or seeds (quinoa, farro, couscous, rice) that is attractively garnished with proteins (tofu, nuts, beans) and veggies (roasted, sautéed, raw) all topped with savory dressing, if desired. Essentially a Mom & Pop diner’s meat and three, hold the beef. I stirred a stocking stuffer into the composition I made just before eating it—Frank’s Rajila Sweet Ginger Sauce. Goodness, that stuff would make cardboard taste delicious. Oops! Silly me. It’s loaded with sugar. Ah well. Here’s a toast to sliding off the yoga mat from time to time. Happy New Year! Drain tofu. Cut into 3 slices. Place on paper towels and drain until most of the excess moisture has been absorbed (weighting down the tofu with a pan or plate accelerates the process). Whisk together 1 tablespoon sesame oil, soy sauce, rice wine vinegar and ginger. Marinate drained tofu in mixture, about fifteen minutes per side. Place marinated tofu on oiled cooking sheet. Bake on center rack of oven until browned, about 25 minutes. 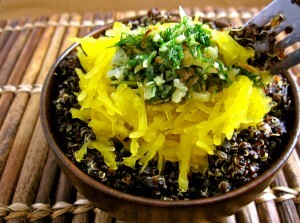 Use leftover marinade may be used to season cooked quinoa. Place 1-2 tablespoons sesame oil in a medium-sized fry pan. 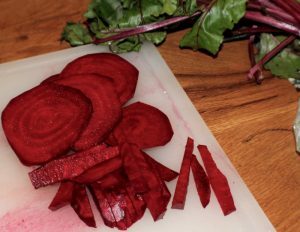 Over medium-high heat, fry beets until crispy, stirring, about 12 minutes. Reheat quinoa if it has cooled. Fill 3-4 bowls 1/3 the way full with quinoa. Arrange tofu, chard, mushrooms and beets over top. Serve. *When cooking chard, I remove the greens from the stem and cook the stem about 3 minutes before stirring in the chard. Sounds delicious–will try it tonight!